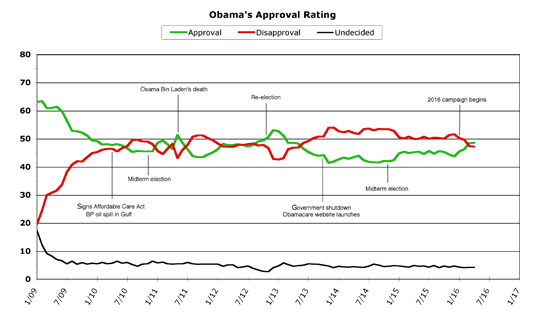 As I predicted last month, President Barack Obama consolidated his recent gains in public opinion polling in April, and only showed very slight improvement in his job approval and job disapproval numbers. While this doesn't sound very exciting, it does show that Obama's recent gains were not temporary, but instead show some real staying power. Let's take a look at the new chart. Even on the big chart, you can now clearly see that Obama is above water in the polling once again (for the first time since the early months of his second term), with his job approval topping his job disapproval rating. 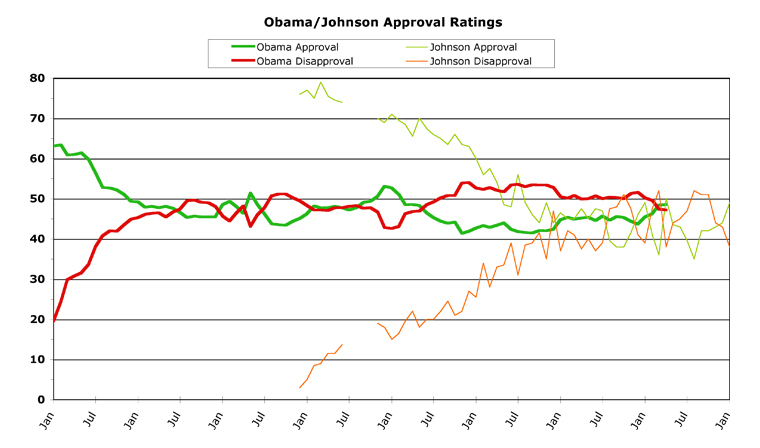 This is also the best start to a calendar year Obama has ever seen in either of his two terms -- since December, he has risen 4.9 points in approval while falling 4.4 points in disapproval. Last month, Obama improved both of these metrics by 0.2 percent, which was a slowdown in his upward trajectory from the previous three months. Obama finished April with a monthly average of 48.6 percent job approval and 47.2 percent disapproval, putting him 1.4 points above water. April was pretty quiet on the political front, at least outside the raucousness of the presidential races. Paul Ryan is probably pretty thankful that so much attention is being paid to the primary races, because it has wonderfully distracted the media from noticing that he's currently failing to get his House of Representatives to do pretty much anything. Congress was supposed to pass a budget framework in mid-April and they were also going to pass some sort of fix to the Puerto Rican budget crisis. They did neither, as the House couldn't agree on the way forward. Ryan is slowly falling into the same trap that ensnared his predecessor John Boehner, but so far the media hasn't been paying much attention. Instead, April was devoted to following the presidential races. This is likely to be true all the way through the first week in November, in fact. 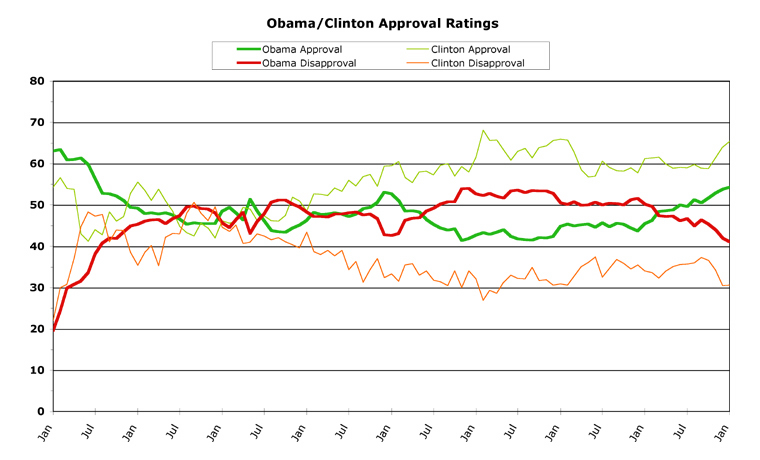 So far, this dynamic has helped President Obama in the polls, but it's hard to see how the rest of the year will play out. Now that Republicans have a nominee, Donald Trump is going to devote all his time and attention on attempting to tie Hillary Clinton to Obama's record and then denigrating everything about that record on a daily basis. Hillary Clinton, meanwhile, will be doing the opposite, by touting Obama's record. She's already tied herself closely with the Obama administration's policies (for the most part) on the campaign trail, which has worked wonders for her among Democratic voters. But once the nominees emerge from primary season and join the battle for the general election, the dynamic will change. Everyone will be listening to both of them, and evaluating the past eight years for themselves. President Obama will likely begin campaigning (in both subtle and overt ways) for Clinton, which will allow him to personally defend his record to the public. Trump seems to have no limits to what he says, and he is correct when he says that he hasn't even begun to attack Hillary yet. When this battle begins in earnest, it is hard to predict how the public will react when scoring the job the current president is doing. Perhaps they'll look at Obama more favorably, while contemplating who will replace him. But, conversely, perhaps they'll respond to daily Republican attacks on Obama in how they feel -- it's impossible to say right now which strategy will work better. The only thing that is easy to predict is that the presidential race will continue to be the biggest political story on the news. Congress will barely be mentioned (unless they do something monumentally stupid), and soon all the members will be heading out on the campaign trail themselves. So the election, as usual, will overshadow everything else for most of the rest of the year. 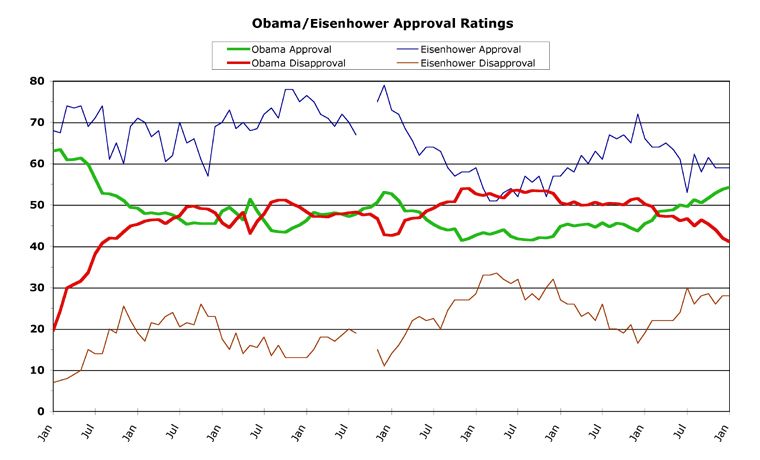 The overall trend for Obama's poll numbers seems to be rather flat at the moment. 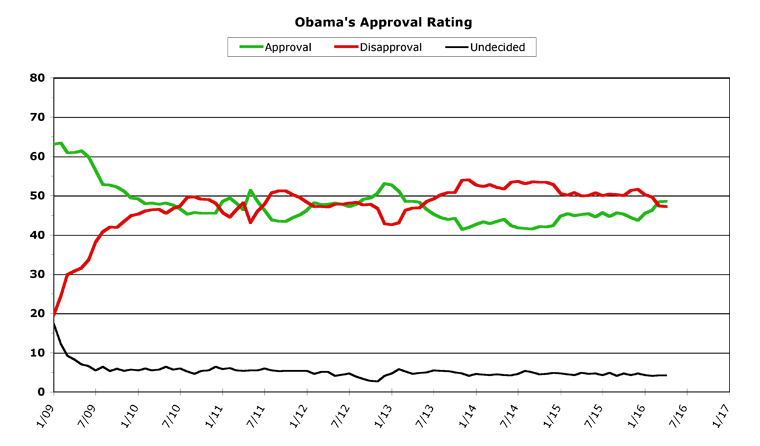 After three extremely good months of improvement, Obama's numbers barely budged in April. The good news was that they still continued upwards, but at a much slower pace. Obama's monthly average job approval rose 0.2 points, after rising 1.8 percent, 0.8 percent, and 2.1 percent in the preceding three months. That is a serious flattening of the trend. 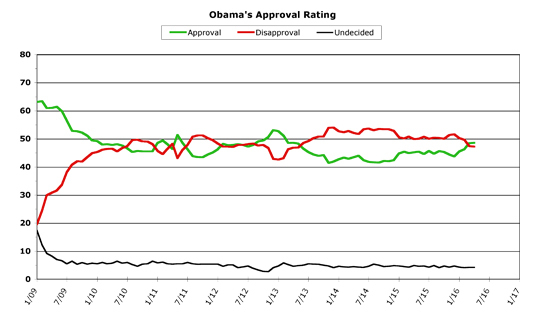 The period preceding the 2012 election is what 2016 could look like for Obama -- fighting to keep his job approval above his disapproval, with a surge at the end that puts him over the 50 percent barrier. The daily rolling averages from April seem to show that this period may have begun. Obama's job approval started at 48.6 percent, rose to 49.1 percent but then (due to an outlier poll or two in the mix) turned down to 47.9 percent -- which actually put him underwater for a couple of days. Obama's numbers then improved up to 48.9 percent before falling back a bit to end up at 48.6 percent -- not only the exact number he started at, but also the overall average for the month. Obama's daily disapproval numbers mirrored this trend, except they spiked upwards farther than his job approval numbers spiked downwards, mid-month. 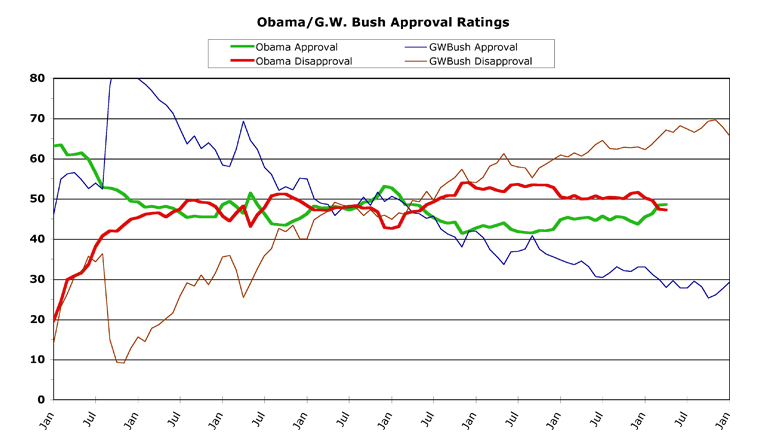 Of course, since then Obama's done far better than Bush, who saw his numbers fall off a cliff after getting re-elected. At this point in Dubya's presidency, his job approval was at a dismal 27.9 percent and his disapproval was sky-high, at 67.1 percent. Bush would never again even reach 30 percent approval from the public, for the remainder of his term. 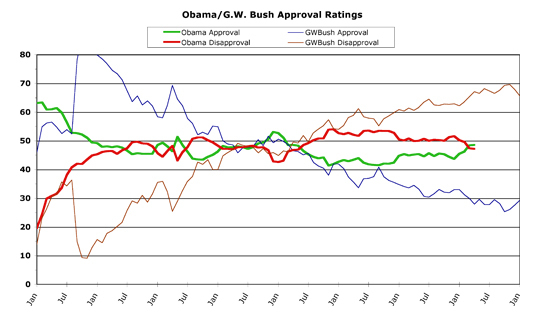 So, obviously, Obama's numbers aren't anywhere near a match for Bush's after re-election. Which begs the question, which president will Obama most closely resemble? Well, the answer is limited. First, there aren't all that many presidents who served more than a single term. Second, public polling data only reliably goes back to Dwight D. Eisenhower (some polling exists for Truman and F.D.R., but it is nowhere near as comprehensive as the data for later presidents). So we realistically only have five presidents to compare Obama to, in his eighth year in office: George W. Bush, Bill Clinton, Ronald Reagan, Lyndon Johnson, and Eisenhower. Nixon was long gone by now, and everyone else was a one-termer. The trends bounce around, but you can clearly see how closely the general trend line is to roughly the past year or so for Obama. If L.B.J. turns out to be the closest president to Obama's final year in office, his numbers will fall but then rise before year's end. However, they won't ever top 50 percent again. If this model holds true, it'll be harder for Hillary Clinton to win the election. Reagan had been riding pretty high in his second term, but that gigantic cliff he fell off was his admission that the Iran-Contra deal was a reality, and that he had, in essence, lied to the American public about what his White House had done. This was a huge loss in public perception of Ronnie, and he spent his seventh year in office slightly above where Obama spent his. 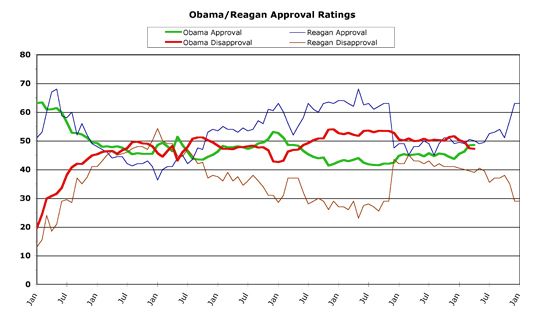 However, their job approval lines are now pretty close (Reagan was exactly at 50 percent right now). 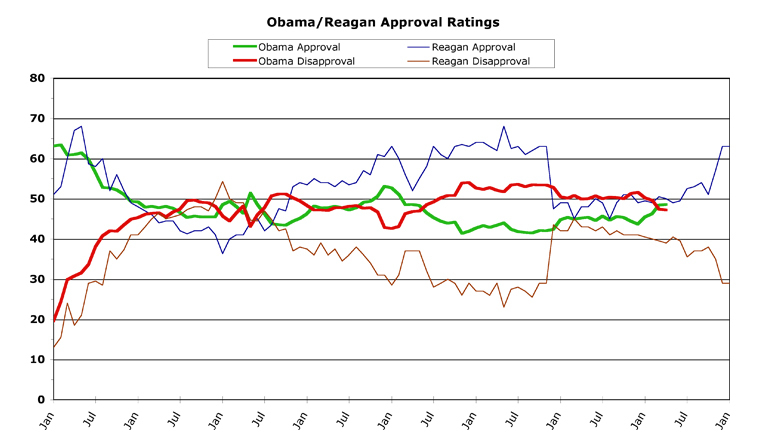 Barack Obama could follow a similar trend for his final year, although he probably won't match the end-of-term bump that Reagan managed (Reagan finished with 63.0 percent job approval). Still, if Hillary Clinton reminds a whole lot of people why they voted for Obama in the first place, and if other people begin to be horrified by Donald Trump's ceaseless antics, then Obama could indeed rise above 50 percent over the course of the year, as Reagan did. If Clinton wins the election, then Obama will also likely get a end-of-term bounce (most presidents do manage this, I should mention) and end up well above 50 percent. 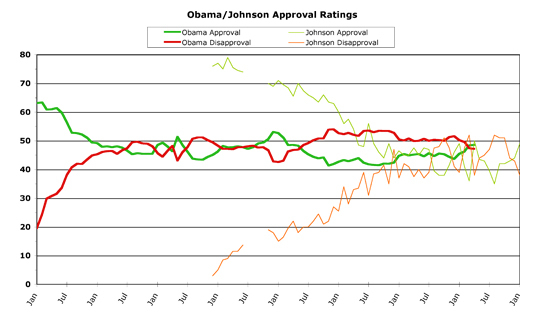 So that's really the long-term question for Obama's polling trends -- will he end up like L.B.J. or more like the Gipper? At this point, I'm pretty optimistic that Obama will be closer to Ronnie in his final year of office, which would be entirely fitting, since the polling during Obama's first year in office was closer to Reagan than to any previous president. Ending in sync with Reagan would be a nice historical bookend, in other words. Yeah, yeah. Let's see how BHO holds up during The Great Bathroom Panic of 2016. It's the new Ebola. I don't understand why Trump wants to let Caitlyn use the ladies room. He really should understand how easy it is to unite the party around lies. He needs to help Paul Ryan get there. I liked when Obama spoke of the reasons for his improved approval ratings at the White House Correspondents' Dinner. He said he thought he knew the reasons for the increase -- and on the big screen flashed a photo of Ted Cruz next to a photo of Donald Trump. I am on the upside of it. Got a persistent cough that is brutal when I lay down. Think I got a whole 3 hrs of sleep last night..